There’s been a lot of hand-wringing coming from pundits and US policy makers past and present surrounding the fall of the Iraqi city of Ramadi to ISIS and the marshalling of Iranian-backed Shiite militias to try to take back the town. A lot of the usual sorts of suspects have been once again making the case that: 1) Letting the Shiite militias do the fighting will both empower Iran and likely worsen already bad sectarian tensions; and therefore 2) The only alternative is for the US to once again wade into the fray, even if that means reintroducing American combat troops on the ground. The discussion on this morning’s Diane Rehm Show is a good example of what’s passing for debate on the subject. The Godzilla-vs.-the Mutos analogy is not a bad one when thinking about the struggle for regional dominance that has been playing out for decades between the US, Iran, and Iraq. This is basically the strategy we pursued during the brutal Iran-Iraq war of the 1980s, letting the two beasts (one of which we marginally preferred over the other) savage each other for as long as they possibly could, with a little help to both sides from us, expecting that at the end of the fight the winner would be far too weak and damaged to pose any real challenge to American preeminence for years to come. So thinking about Iran, Iraq, and ISIS today, would it be so terrible for US interests to just let them fight? Let Iran invest more time, energy, resources, manpower, etc. propping up an ineffectual Shiite-dominated Iraqi state. Continue providing just enough combat air support so that we stay in the good graces of the Iraqi regime but not so much that we pave the way for an easy victory for Iran’s proxies. Let them savage each other. Is this a cold-blooded strategy? Sure. But would it be out of character for the US, especially in that part of the world? Hardly. But that doesn’t mean that it’s necessarily successful. When pundits, policy makers, politicians, and political opponents make the blanket statement that terrorism doesn’t work, they often do so by arguing the point from the narrowest of perspectives, focused solely on the stated long-term objectives of a violent political movement. Organizationally, groups that are committed to using violence to advance a political objective will at some point have to act if only to maintain internal morale and cohesion. Terrorist groups that fail to engage in terrorism can see their members either lose heart and drift away, or alternately break off to strike on their own or join up with another group that they believe is willing to fight. I’m reminded of a conversation I had several years ago with a former INLA member from Derry, who explained to me how he ended up in that group. He said that he and a small group of friends were initially part of a PIRA quartermaster unit that was involved in moving weapons across the border from the Irish Republic for use in the North. They became frustrated that they were denied permission to use those weapons themselves, instead handing them over for use by other active service units. So he and some of the others went over to the INLA. They had no interest in that organization’s Marxist politics. They wanted to fight, so they defected to a group that agreed to let them. 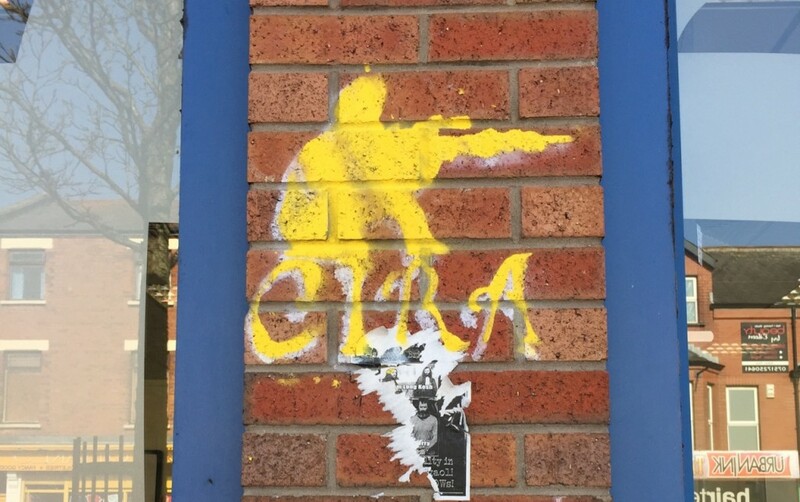 This organizational imperative is likely part of the explanation for the images of armed Continuity IRA volunteers “patrolling the streets of Lurgan” (shown above) that appeared on social media in late April and were subsequently picked up by news outlets across Northern Ireland. 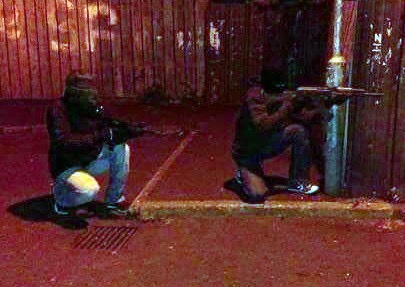 While hardly a show of strength in any meaningful sense, the caption that accompanied the photo when originally posted on Facebook, “Volunteers… patrolling the streets of Lurgan on the lookout for England’s armed colonial police and undercover British soldiers who are operating unwantedly across occupied Ireland,” surely gave a boost to the collective ego of the group’s members and supporters. In organizational terms, that’s a success. And it also served another purpose, bringing publicity to the group and by extension to the group’s cause. If publicity is the lifeblood of any terrorist campaign, than any operation that brings attention to the group is a success, not matter how “unsuccessful” a specific operation is in concrete terms. Every time politicians or police officials stand before the press and denounce their armed opponents while announcing measures to respond to the threat these groups pose, they play into the hands of movements eager to be recognized as meaningful and dangerous challengers to the status quo. Finally, operationally, even unsuccessful attacks — bombs that fail or only partially detonate, grenades that miss their targets, and so on — serve a useful purpose for the group. Groups gain greater operational sophistication and capacity through experience, by learning from their successes as well as their mistakes and failures (assuming those don’t land them in jail or the grave). At the same time, by their nature, terrorist attacks can be effective even when they fail. Areas are closed off, police and other security resources of the state are diverted and potentially stretched thin, people’s daily lives and routines are disrupted, as noted above attention is drawn to the group and its cause. With luck, perhaps the state can be provoked into over-reacting, demonstrating in vivid terms to the terrorist group’s perceived constituency and the public at large the injustice and oppression of the system that the terrorist group is fighting against. Again, events of the last few weeks in Northern Ireland (for example a small bomb exploding outside a probation office in Derry, a bomb attack on a police patrol in North Belfast which missed its target, a substantial bomb found and defused in Ardoyne, two partially exploded bombs found outside a Territorial Army base in Derry) point to the effectiveness of essentially ineffective terrorist attacks. As a result of these and other recent incidents, the PSNI announced today that they would step up police patrols and increase their use of check points in order to counter the threat posed by dissident Republicans, which was described as severe. The resulting increase in armed police presence on the streets, and the inconveniences and disruptions to daily life, can be seen to work to the advantage of a movement that brands the police an army of foreign occupation and will attempt to spin this security response as little more than harassment indiscriminately targeted against the Nationalist community. None of the above discussion is to claim that an armed campaign has any chance whatsoever to bring about the end to British rule in Northern Ireland, the long-term objective of the groups that are carrying out these and other largely ineffectual actions. To the contrary, many dissidents argue today that the conditions for successful armed struggle no longer exist in Northern Ireland (read the IRSP’s assessment of the potential for armed action recently republished at The Pensive Quill), and that under these circumstances a continuation of violence is politically ineffective if not immoral. On these terms then, terrorism doesn’t work. But if we consider all the short-term objectives that terrorism can effectively serve, we have to recognize that even when it fails, terrorism works. And that’s why groups continue to use it. *If I were in my office and not at my kitchen table this would be a longer discussion, with proper acknowledgment of the academic sources I’m drawing upon. But since I’m not, I’ll just wing it and hope for the best. At least I’m not linking to Wikipedia anymore. Dee Fennell being arrested this morning. Photo from BelfastLive. Dee Fennell, a young Republican activist from Ardoyne in North Belfast was arrested this morning for the speech he made at the Easter Rising commemoration in Lurgan more than a week ago. A prominent dissident Irish republican has been arrested in connection with a speech he made at Easter supporting “armed struggle”. The Police Service of Northern Ireland confirmed on Monday that they had detained a 33-year old-man after a raid on his home in the Ardoyne district of north Belfast. 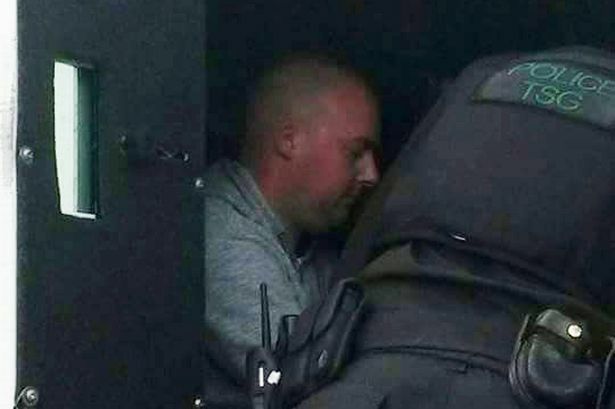 The man in custody is Dee Fennell, who told hardline republicans at a gathering in Lurgan on Easter Sunday that “armed struggle must be a contributory factor to a wider struggle”. Fennell also described armed attacks as legitimate during his speech to commemorate the 1916 Easter Rising. He said: “The use of arms prior to 1916 was legitimate. The use of arms in Easter 1916 was legitimate. The use of arms after 1916 was totally legitimate. Unionists have been demanding that Fennell be arrested, with the Ulster Unionist party election candidate in Upper Bann, Jo-Anne Dobson, describing his remarks as disgusting. A PSNI spokesman said the suspect had been taken for questioning at the police’s serious crime suite, at Antrim. Fennell is one of the most prominent dissident republican spokesmen and also represents a residents’ group opposed to a contentious Orange Order march past the Ardoyne area, where he lives.